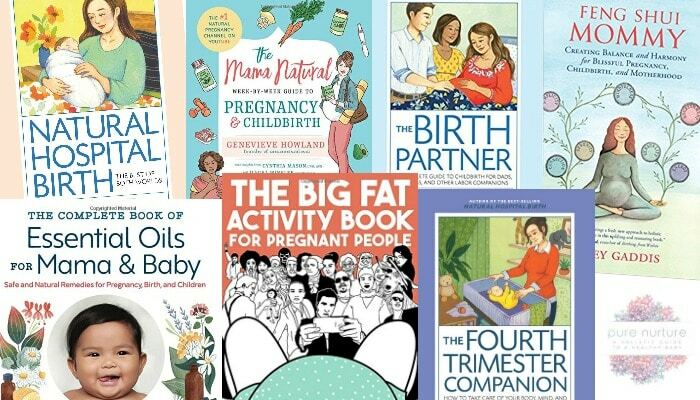 The best pregnancy books of 2017 are informative, helpful, hilarious and specific. 2017 was a great year for new pregnancy books! Of course, as is my annual tradition, I have created a list of my favorite and the best pregnancy books of 2017. Enjoy! If you’re a book worm like me, you may enjoy previous years’ best of lists. And here’s the most current pregnancy book post. In no particular order, here are the best pregnancy books of 2017. Summary: The Mama Natural Week-By-Week Guide to Pregnancy & Childbirth, by fellow blogger Genevieve Howland of Mama Natural, is an all encompassing book on how to have a healthy (and natural) pregnancy, birth and postpartum. And when I say all encompassing, I mean it. From going organic, to making your home healthier, exploring birth options and drinking cod liver oil, you’ll rock the natural experience if you even follow 50% of the advice in this book. I love how thorough this book is and that it’s organized week-by-week. By spreading out the information a little bit at a time it makes implementing the information attainable. Summary: If you are anything like me, The Complete Book of Essential Oils for Mama & Baby is a PERFECT fit for your motherhood journey. I always struggle to find quality, evidence based information on essential oils for pregnancy, birth, and beyond, especially when it comes to breastfeeding. One thing I love about this book in particular, is that breastfeeding and essential oil use is discussed in great length! There are even a few essential recipes you can use for breastfeeding problems like plug ducts. Summary: Most women that stumble upon Mother Rising are hoping to achieve a natural hospital birth. Natural Hospital Birth, The Best of Both Worlds is the definitive guide on how to do just that. Having had a natural hospital birth myself, I understand the complexities of such a desire and appreciate the author’s title of chapter one – You Can Do It. What an encouragement! Most women that come to the free hospital childbirth class I teach have little confidence that it’s even a possibility, yet from page one I can sense how empowering this book is to new mothers. My favorite part? The birth stories. We need others’ stories to encourage us in our own. This book is a must read for those endeavoring to have an empowering natural hospital birth! Summary: The Birth Partner is a must read for those planning on being an active participant at an upcoming birth. Doulas, partners, grandparents, etc., should read this book in order to achieve their desires of assisting a woman through the unknowns of childbirth. My two favorite things about this book is how easily it is navigated (it’s designed to be accessed during birth if need be) and the illustrations on positioning and procedures. This book is approachable and an extremely valuable resource for all those that call themselves a birth partner. Summary: Feng Shui Mommy is written by a professional organizer turned childbirth guru taking the best pieces of each and applying them to this book, one of the best pregnancy books of 2017. If well-flowing chi and hypnobirthing pique your interest, this book is right up your alley. My favorite thing about this book is that it doesn’t contribute to the polarization of of motherhood by insisting on either epidurals or a homebirth, but encourages unity in that what unites women together are our own unique experiences. Feng Shui Mommy will guide you on a journey through each trimester, including the fourth, that will help you be a better you in mind, body, and spirit. Summary: The Big Fat Activity Book for Pregnant People is my favorite book on this list. I’ve never seen anything like it! If you find yourself pregnant, but also are a playful person that doesn’t take life too seriously, you will enjoy this activity book. But secretly, it’s not just an activity book. This hilarious diversion is also a pregnancy journal, albeit a silly and superficial one. If you don’t buy anything on this list, buy this. I can’t wait to give it to all my pregnant friends! Summary: Pure Nurture provides new mothers the missing pieces of the healthy pregnancy and postpartum that they long for. By teaching the foundational concepts of self-care, new moms will have the tools needed for a healthy baby, but also health and wellness within themselves. Added bonus? There’s delicious recipes at the end of the book. My favorite is the Strawberry Shortcake Smoothie! Summary: When You’re Expecting Twins, Triplets, or Quads is a must-read for those pregnant with BABIES. Typical pregnancy books may devote a few paragraphs to the concerns of a multiple pregnancy, but this book guides parents through the overwhelm of all that is carrying more than one baby. With an emphasis on nutrition and self-care, this book gives a realistic, albeit cautious, instructions on achieving a healthy, full-term, multiple pregnancy. Summary: “Please place the oxygen mask on yourself before assisting others with the placement of theirs.” This well-known phrase repeated by flight attendants around the world is similar advice new mothers are given after the birth of their babies. Easy to say, difficult to implement. Exactly HOW is a woman supposed to put priority on recovering from pregnancy and childbirth, in addition to balancing the normal demands of life AND now a newborn? Seems unattainable, especially in our culture of impossible expectations. The Fourth Trimester Companion gently leads new mothers through the unknowns of postpartum and gives practical advice on how to achieve balancing self-care with everything else that’s going on. If you want to get in the head of a woman that just had a baby but also learn how to make the postpartum experience less stressful and more enjoyable, this is your book. Summary: A risk of pregnancy is the potential for loss and a broken heart, even before baby is born. I am a part of this sorrowful sisterhood, as are many women (I’ve heard somewhere that as many as one in five pregnancies end in miscarriage). I’d like to say that I handled my miscarriage experiences with grace surrounded by a tribe of compassionate people. Unfortunately, I became angry, jaded, and isolated myself. I could barely talk about it. If you are a follower of Jesus, Loved Baby catches you where you are, holds your hand and leads you through the grief of pregnancy loss. This devotional would make an excellent gift for a (Christian) loved one that unfortunately has had a miscarriage. To recap, the following are the best pregnancy books of 2017. 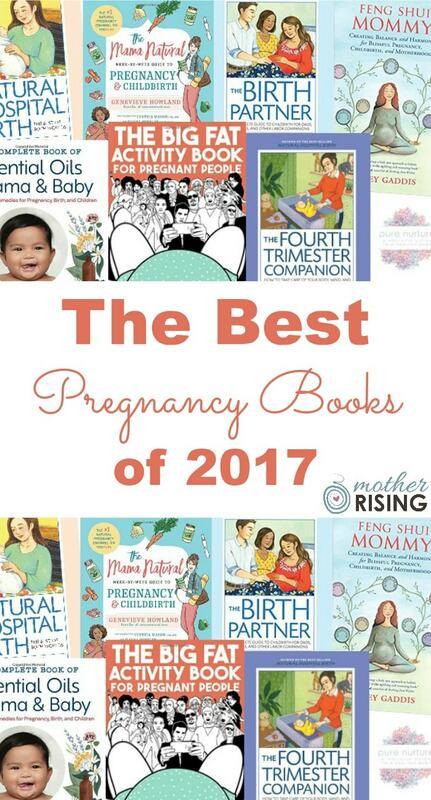 What a great year for pregnancy books! If you’ve read any of the books on this Best Pregnancy Books of 2017 list, let us know what you thought of it by leaving a comment. If you think another should be added to the list, leave a comment and let us know why. Thanks for coming by! What are your favorite postnatal books? esp those that go beyond the fourth trimester? Parenting books? The ones I’m reading right now are Boundaries with Kids and Shepherding a Child’s Heart.